Valentine's Day is lovely. But there's one quick thing you can do today and all the rest of the times you feel like sending someone flowers. Ask if your florist carries fair-trade, organic flowers. The Rain Forest Alliance has an amazing set of facts about cut flowers and ferns that makes for good reference. You can find it here. And if you're looking for a good place to buy cut flowers that are responsibly sourced, guess what? You don't need to look any farther than 1-800-FLOWERS, which responded within 72 hours to a push from Change.org to not only publish their flower sources, but to offer a selection of fair-trade sourced cut flowers and ferns for Mother's Day. Yes, you know, Mother's Day. The holiday that celebrates the other love of your life. Hub Friday: What are your Keystones? One of our rooms in our CityView location is called the Keystone Room. Why? Well, Philadelphia is sometimes called the Keystone state, sure, but what's that mean, really? 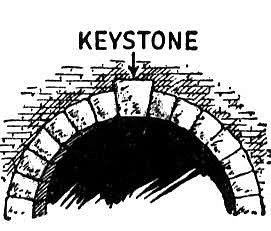 A keystone is the critical piece in an arch that holds the weight of the entire structure, allowing it to stay strong and up. Pennsylvania's nickname dates back to the early 1800s, partially because Independence Hall is where the delegates to sign the Declaration of Independence; partially because of its central location in the 13 original colonies. It's a clear indication of the state's importance. So yeah, we named the Keystone room for Pennsylvania. But we also named it for some other keystones: Our employees. Recently, The Hub had its 4th Quarter Outing and Awards ceremony. We use these outings (they happen four times a year, natch) to celebrate our employees, who are our real keystones. We spend our time enjoying each other's company, and we make sure our Stars of the Quarter and of the Year get their just rewards. 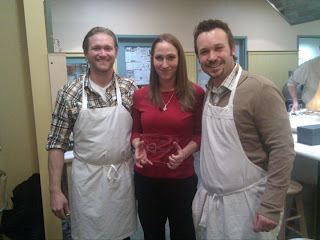 This quarter, our awardees are Star of the Quarter Stephanie Koch, who's our new Sales Director. Our star of the year is Serena Butler. These employees are true exemplars of our staff. But each and every member of the Hub staff is a keystone in and of his or her own right. How do you recognize your keystones? 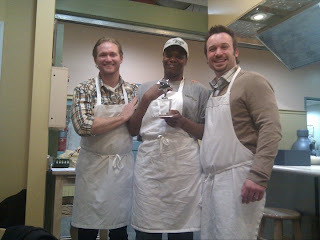 For more photos from our 4th Quarter Outing (it was a blast!) click here, and like our Facebook page!